Clarkton, NC has a unique distinction as home to one of the most iconic and recognizable women in modern history- Whistler’s mother. 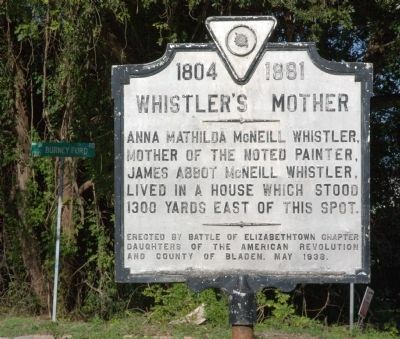 Anna McNeill Whistler was born in Wilmington, NC to Dr. Daniel and Martha Kingsley McNeill on September 27, 1804. Her father owned Oak Forest Plantation in the Brown Marsh community which later became Clarkton. The house was located in the east of end of Clarkton and burned to the ground in 1933. According to one account on the history of the land, the plantation house of Oak Forest Plantation was constructed in 1737. Anna lived at Oak Forest at various times up until the Civil War when she escaped to London on a Confederate blockade runner. Anna McNeill Whistler lived with her son James in London for several years. She did not always approve of her son’s liberal lifestyle, but she took an active interest in his painting. In 1871, Whistler painted her in his work, Arrangement in Gray and Black, the picture popularly known as Whistler’s Mother. Due to the popularity of the painting, Anna McNeill Whistler became one of the most recognized North Carolinians in history. During the Great Depression, the piece traveled America in a 13-city tour, which included a stop at the 1933 Chicago World’s Fair. From this exposure, America fell hard for Whistler’s Mother. She was not only featured on a 1934 stamp, but also inspired an 8-foot-tall bronze statue erected high on a hill overlooking Ashland, Pennsylvania. Hooks Systems is proud to have been selected as the town’s I.T. provider. The town has increased its efficiency in serving the community by having Hooks install a new Windows Server and a faster network. Hooks Systems also provides 24 x 7 monitoring and helpdesk support to towns across Southeastern NC including Carolina Beach, Oak Island and St. James.